How to teach your child guitar if you can’t play a note and have no sense of rhythm – a parents account! I have a student aptly named Riffy, she began having lessons when she was 6 and that was going on for 2 years ago. This is her Dad’s very well put together account of what to expect and look out for when thinking about guitar lessons for your/a child. ‘How to teach your child guitar if you can’t play a note and have no sense of rhythm. And even if you are musically talented I hope there’s something here for you. 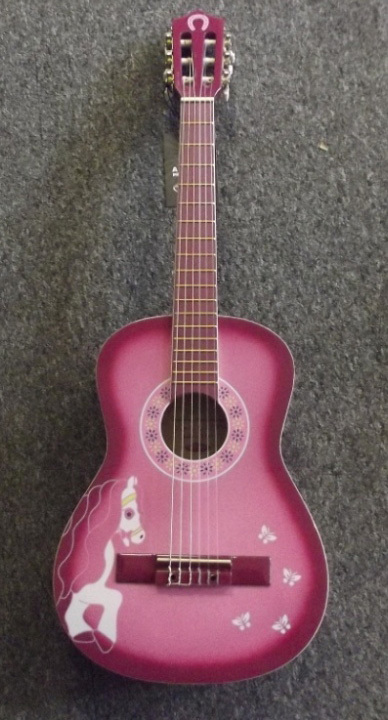 My daughter, Riffy was almost 7 when she saw a pink guitar at a car boot and persuaded me to help her buy it, I added to the money she had on the condition she had lessons as I didn’t want to see it sit in a corner and gather dust. So it started, a totally random act to kick things off and then the luck of finding Jo to teach her but no real planning. Luckily the guitar was decent, playable, the right size and would stay in tune, In retrospect saner people might have found a teacher first and asked her advice. Or checked out a decent music shop. Equally Riffy was probably just about old enough to start learning to play. Buy a stand or possibly better yet get a wall hanger for your guitar, it’ll keep the guitar safe from being knocked over if it’s leant against a wall and handier than if it’s put safe on top of a cupboard. Once you’ve got a stand use it, there is nothing to describe the classic slow motion fall of a guitar slipping over and heading for the floor. Buy a load of plectrums/picks it’s good to try different ones and they tend to go missing. Most annoyingly they have a homing instinct for falling into the sound hole of an acoustic guitar, I’ll be making my fortune by inventing a device to retrieve picks from inside an acoustic. Get a cheap digital tuner or an app for your phone and use it to check your tuning. Practise tuning by ear and ask your child if the guitar sounds in tune when they start to practice. A metronome is another very, very useful thing. You can get one as an app for your phone, alternatively there are electronic and old fashioned mechanical versions. It’s worth finding what works for your child, Riffy for example likes Jo’s metronome because it has a nice visible flashing light on it..
What most of this stuff is for is to make it easy to practice. lf the guitar is tuned, and ready, close to hand your child just can pick the guitar up and start playing. This means you can get in a quick 5 or 10 minute practice with no fuss and no wasted time. Practise a little and often, any practice is better than no practice and frequent practice keeps things fresh in the mind. After a lesson as you’re unpacking get your child to quickly run through what they’ve just done. Sit in with your child when they practise, don’t expect them to motivate themselves. Expect them to get things wrong and don’t jump in with criticism. Ask if they can hear something wrong if they keep repeating the same mistake, but mostly just encourage them when it sounds good. Turn practice into a game, make it fun, if you can play, play along with them, if you can’t get them to teach you what they’ve learnt. Use bribery, I treated Riffy like a busker one time dropping 10p’s in her piggy bank every time she repeated an exercise. Video them practising, get them to show off for the camera, don’t worry about quality, or worry about complex camera set ups, I just use my phone cam, if you do get a good result and your kids happy show it off to friends and relatives, let them get some positive feedback. Build practice in as part of the routine, I chose bedtime as I already used that for reading practice and my daughter was getting older so instead of staying up later I just added an extra activity. If practice is part of a routine it reduces arguments and resistance. Chris takes a great interest in the lessons and the process of learning guitar, often having lessons to feed his interest and stay on top of the game! I teach all guitar to all ages so if you have a child who you may think of sending to guitar lessons, feel free to message me with any questions.